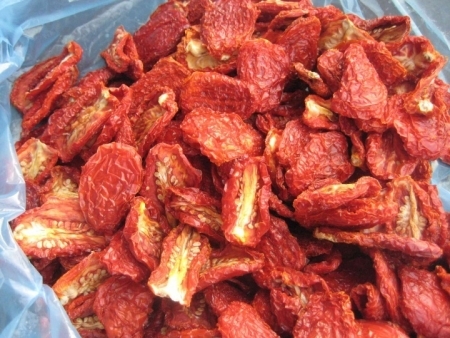 Sun-Dried Tomatoes are ripe tomatoes which are placed in the sun to remove most of the water content. Twenty pounds of fresh, ripe tomatoes will dry down to just one pound of sun-dried tomatoes. Sun dried tomatoes have the same nutritional value as the fresh tomatoes they are made from: they are high in Lycopene, antioxidants, vitamin C and low in sodium, fat, and calories. Sun dried tomatoes were born in Italy as a way to store fresh tomatoes for the winter. Fresh tomatoes would be dried in the hot sun on the tile roofs as a way to preserve them for the cold months. Today they are still dried in the sun, but in much larger quantities and under strict quality controls. The role of sun dired tomatoes are expanding in today’s cuisine. We always provide the highest quality sun dried tomato products to our customers according to their requests. Our product range is Salted or Sulfur Dioxided (SO2) treated tomatoes Halves, Strips (Jullienne Cut), Diced and Ready-to-Eat (RTE).